Ceramic Trinidad Limited have been the exclusive distributors of MAPEI products for over 15 yrs. CTL has fostered this partnership because of MAPEI’s unrivaled experience, technical service and product quality. CTL also hosts yearly MAPEI seminars for tiling contractors and architects to keep them abreast of the newest technologies available. Over the past 70+ years, one branch of MAPEI has developed into a worldwide leader in the manufacture of total systems for the installation of floor coverings in commercial and residential construction. Their surface preparation products condition floors and walls for the optimal installation of tile, carpet, wood, vinyl and decorative concrete. Their installation products include mortars, grouts, adhesives and admixtures that ensure customers’ satisfaction with any floor covering they choose. Innovative new products developed by their R&D Department continually keep MAPEI well-positioned in the minds of professional contractors and do-it-yourselfers. A second branch of MAPEI that has rapidly begun to expand into the American market is their Concrete Restoration Systems. These CRS products help repair damaged concrete in commercial and industrial projects as well as infrastructure settings such as bridges and wastewater systems. These repairs range from the application of waterproofing and corrosion inhibitors to restoration of damaged areas in horizontal, vertical and overhead structural concrete. MAPEI has also developed a special family of self-leveling underlayment and screed mortars to level and smooth interior and exterior construction surfaces. Throughout all MAPEI’s manufacturing processes for adhesives, sealants and other chemical products for the building industry, they have maintained a strong commitment to the environment and to sustainability. They work continuously to have all of their locations ISO 9001-certified for Quality Management and ISO 14001-certified for Environmental Management. They regularly review product formulations against emerging technology and reformulate when appropriate to produce ever more environmentally friendly products. Keracolor S: Premium sanded grout with polymerKeracolor S is a premium-grade, preblended, polymer-modified sanded Portland-cement tile grout that requires only the addition of water for mixing. It will grout joints from 1/8″ to 5/8″ (3 to 16 mm). Keracolor U: Premium sanded grout with polymerKeracolor S is a premium-grade, preblended, polymer-modified sanded Portland-cement tile grout that requires only the addition of water for mixing. It will grout joints from 1/8″ to 5/8″ (3 to 16 mm). Ultracolor: Premium Rapid-Setting Sanded Grout with PolymerUltracolor Plus with DropEffect™ technology is an ultra premium, fast-setting, polymer-modified, color-consistent, nonshrinking, efflorescence-free grout for joint widths from 1/16″ to 1″ (1,5 mm to 2,5 cm). DropEffect technology reduces surface absorption to help repel water, dirt and grime from penetrating grout joints. Ultracolor Plus is specially formulated with MAPEI’s High-Hydrated Cement Technology (HCT™) to eliminate the common problems related to Portland-cement grout, such as color consistency and efflorescence. Kerabond & Keralastic: Premium flexible tile mortarKerabond/Keralastic System is a high-performance, two-part system: Keralastic ™, a second-generation “flexible” acrylic latex additive, is used to enhance the performance of Kerabond ™, which is a premium-grade dry-set mortar. This system has exceptional bond strength, flexural strength, elongation and freeze/thaw durability. To ensure proper flexibility, always use a latex additive when applying a dry-set mortar over plywood or to set nonvitreous tiles. Ultracontact is an ultra premium, normal-setting, polymer-modified, high-performance full-contact mortar. Ultracontact meets or exceeds ANSI A118.4 and ANSI A118.11 requirements when mixed with water. Ker 111: Economy-Grade Tile Mortar with PolymerKer 111 is a single-component, thin-set mortar for interior and exterior installations of dimensional stone, ceramic, porcelain and quarry tile. This mortar is formulated with a unique dry polymer, resulting in good adhesion to substrates and tile. Ker 111 can be used for interior and exterior installations of tile in most residential floor and wall applications. In commercial applications, use on interior floors and walls as well as exterior floors. For exterior commercial wall applications, use either the Kerabond/Keralastic ™ or Granirapid ® system. Ker 111 meets or exceeds ANSI A118.4 requirements when mixed with water. Adesilix P10: Premium glass tile mortar with polymerAdesilex™ P10 is a premium-grade, bright white, multipurpose thin-set mortar formulated with nonsag properties. Adesilex P10 is designed for glass tile, glass mosaic and marble mosaic, and is ideal for light translucent natural stone. Kerapoxy IEG: 100%-Solids, Industrial-Grade Epoxy GroutKerapoxy IEG is a water-cleanable 100%-solids epoxy grout, with high chemical and stain resistance. It is a nonshrinking, nonsagging, fast-curing, efflorescence-free grout system. It is ideal for installations where high-strength, mold- and mildew- resistant grout joints are required. Kerapoxy IEG has high temperature resistance and can be steam-cleaned. It is formulated for use in cooler temperatures. Opticolor: Optimum-Performance, Stain-Free GroutOpticolor is an improved, water-cleanable, reaction resin grout with chemical and stain resistance. It is a nonsagging, efflorescence-free grout with no shrinkage. Opticolor provides color uniformity, stain resistance and durability beyond that of cement grouts. In addition, it is easy to maintain, will clean to the original color and contains BioBlock™ technology. Type 1: Professional-Grade Floor and Wall Tile AdhesiveType 1 is a professional-grade, traditional, nonflammable, organic adhesive for setting impervious, vitreous, semivitreous and nonvitreous tile over gypsum drywall (walls only), cement board, exterior-grade plywood, concrete and masonry block. This adhesive is used for interior applications only. Type 1 meets or exceeds ANSI A136.1, Type 1 requirements. Ultraplan Easy: Easy-preparation, fast-setting,self-leveling underlaymentUltraplan Easy is an HCT™ (High-Hydrated Cement Technology)-based, quick-setting, self-leveling underlayment that typically requires only a clean, soundly bonded substrate before application. Typically requiring reduced surface preparation, Ultraplan Easy provides lower installation costs and fast turnaround on job sites. 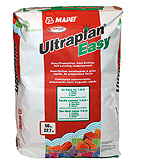 It features high strength and is able to withstand light foot traffic after 2 to 3 hours of installation.Developed with MAPEI’s “green innovation,” Ultraplan Easy is LEED-complaint and helps to contribute valuable points toward LEED-certified projects. The above products are what we typically keep in-stock, however, all MAPEI products are avialble for custom orders. Click here to learn more about the company and the other products that are available.